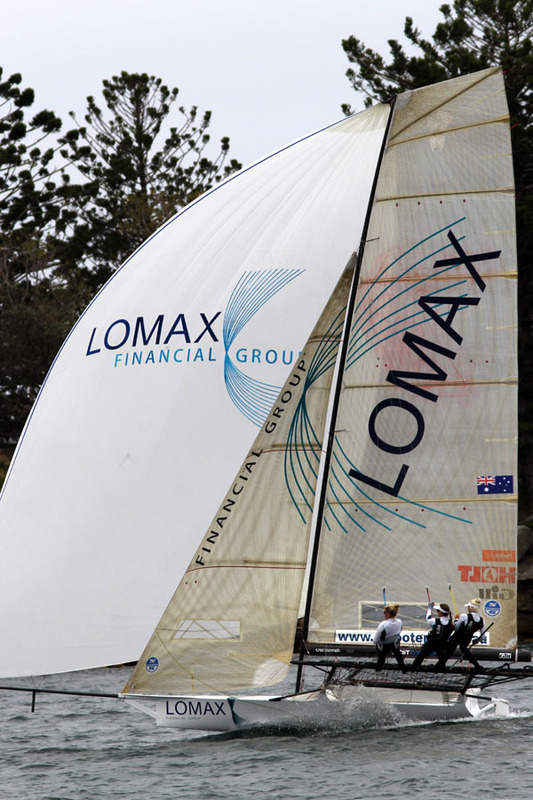 Thurlow Fisher Lawyers took another step towards defending her Australian 18ft Skiff Championship with her second all-the-way win in Race 2 of the Championship on Sydney Harbour today. 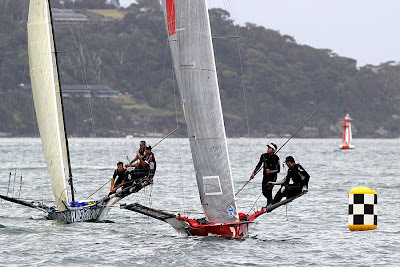 The Thurlow Fisher team of Michael Coxon, David O’Connor and Trent Barnabas were superb again as they powered their way to a brilliant 3m12s win in a light SE wind. 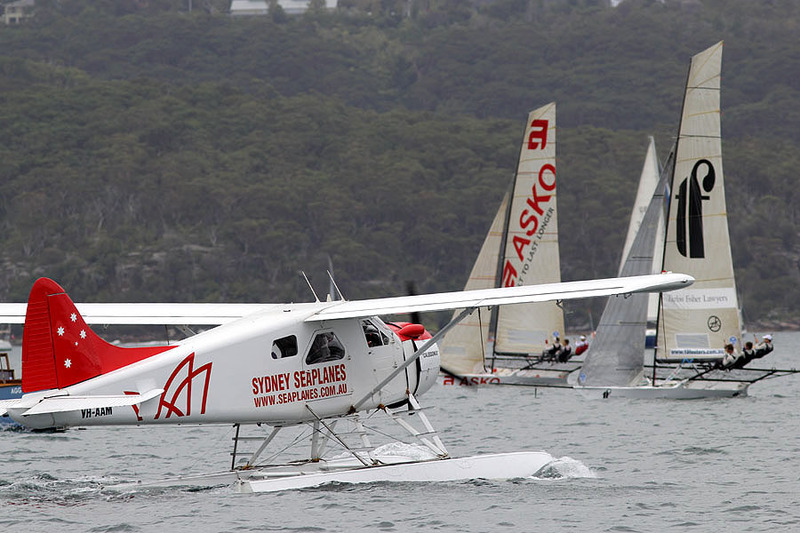 Fourth place went to Marcus Ashley-Jones’ Asko Appliances, followed by Smeg (Nick Press) and Rabbitohs-Kenwood (Brett Van Munster). Thurlow Fisher Lawyers, with her two wins, leads the series on two points, followed by Gotta Love It 7 on 4, Pure Blonde 10 and Coopers-Rag & Famish Hotel (Jack Macartney) on 11. Gotta Love It 7 won the start at the pin end of the line and quickly set a cracking pace to the windward mark in Rose Bay. 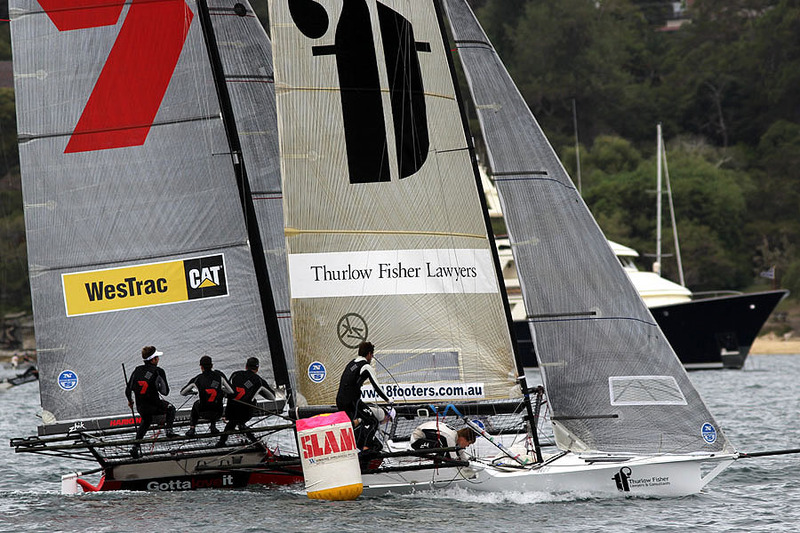 Thurlow Fisher gained a lift approaching the mark and narrowly led ‘7’ as spinnakers were set for the long run from Rose Bay, in the south, to Robertson Point on the northern shore. 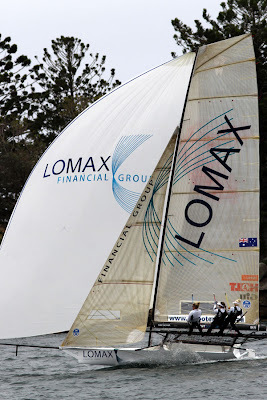 Asko Appliances, Lumix (Jonathan Whitty), Pure Blonde and Smeg were in the group just behind the two leaders. Thurlow Fisher opened up a 30s lead, while Gotta Love It 7 failed to show her usual downwind speed and fell back behind Asko Appliances at the bottom mark.Lumix was fourth, followed by Smeg and Pure Blonde. 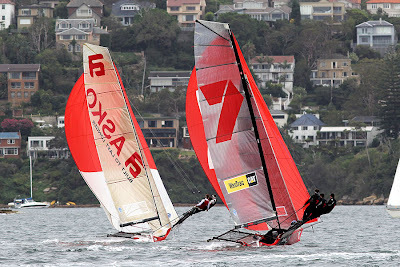 The next windward beat saw Thurlow Fisher’s lead go out to one minute at the Clarke Island mark, while Asko continued to hold out ‘7’ by just a few seconds. 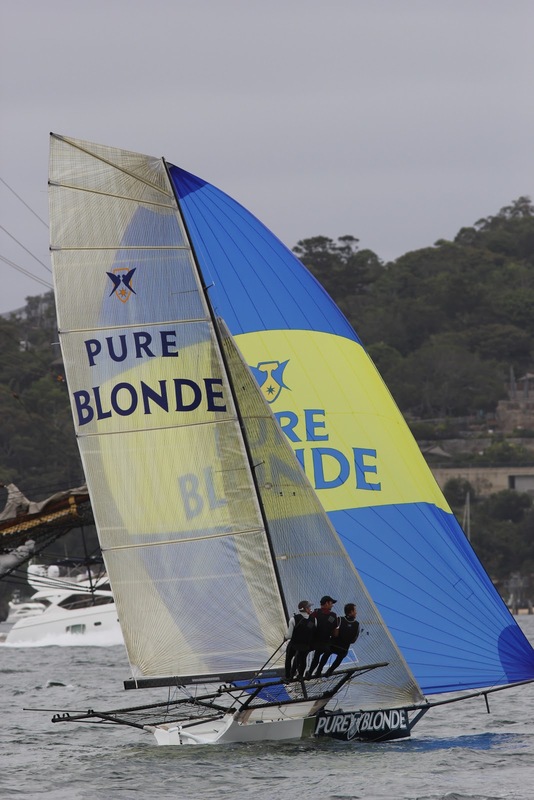 7’s downwind speed was again way below par as she lost another placing to Pure Blonde at Chowder Bay, but once more she trailed Thurlow Fisher Lawyers by just a few secs. 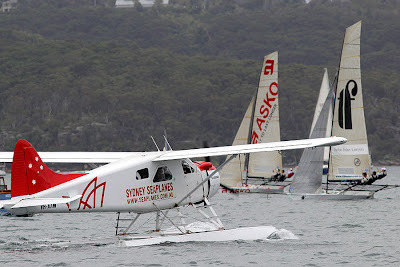 at Rose Bay. 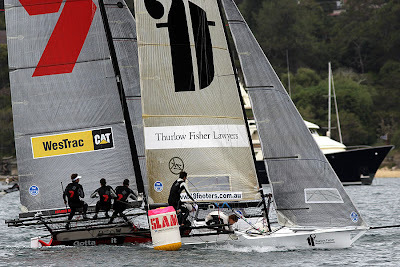 The Thurlow Fisher crew were then superb on the ‘loop’ from Rose Bay to Taylor Bay, then back to Rose Bay, and their lead had blown out to 1m30s and from that point there was never any doubt about the victory. Most attention then swung towards the race for the minor placings and this was sensational as five team were in the battle over the last two legs of the course. 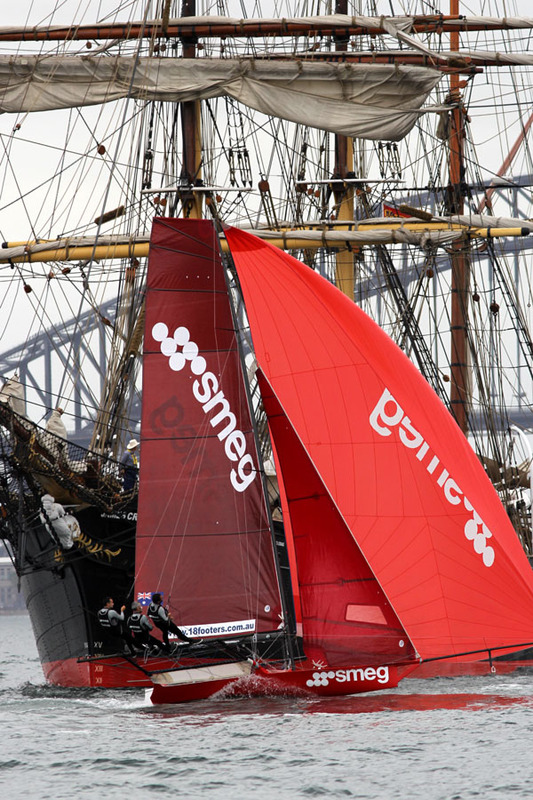 With only 200 metres left to sail on the final windward leg to the finish line off Clarke Island, Gotta Love It 7 was still in fifth place behind Pure Blonde, Asko Appliances and Smeg. The skill and never-say-die attitude of Jarvin and his team came to the fore as they brought Gotta Love It 7 home in second place to keep Thurlow Fisher’s points lead back to two points.